You can create a home and life you love! Are your scrambling for dinner ideas for those busy school days? Here are five simple one pan back to school dinner ideas. Each recipe is yummy and can be altered a bit using ingredients you have on hand and adding additional vegetables to give a nutrient boost. Enjoy! Creamy Chicken and Rice Casserole – no soup: However, if you love the creamy taste of mushroom soup in your casseroles buy organic cream of mushroom. I buy several brands and have no particular favorite just read the ingredients and make sure you recognize all of them as real food. Layered Enchilada Bake – This recipe is super simple, with a whole bunch of brand names ( just use what you have in the pantry and freezer). You can switch the beans or ground beef with leftover grilled veggies to change it up a bit. I like grilled and diced zucchini. I rarely use ground beef, but use free-range ground turkey it is really gone done at price as of late so is easier than ever on the budget. 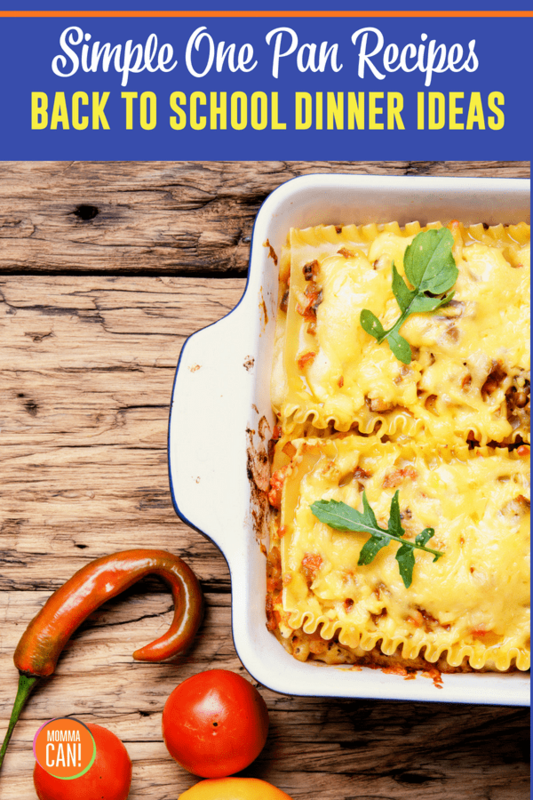 World’s Best Lasagna– Well I reckon if you are going to eat lasagna it may as well be the World Best! Oven Barbeque Chicken This is a recipe that we ate at least twice a month growing up, of course, my momma used Kraft BBQ sauce way back when, and you can definitely simplify this recipe with a bottled sauce made with real ingredients and no high fructose corn syrup. Upside Down Deep Dish Pizza Casserole – The minute I read this recipe I started dreaming of pizza. My best friend in high school had a stepmom who made the best pizza casserole in the universe. The neighborhood kids would always hang out in Barb’s front yard on Pizza night in high hopes there would be extras. It was so darn good. I love the whole concept of one pan and am on the lookout for more of these fabulous recipes to make for my family. Do you have a favorite one pan meal? I would love to hear about it! Bonus – Take our Fabulous Spicy Southern Potato Casserole recipe and add 2 cups of chopped chicken! This will make it a meal, yum! 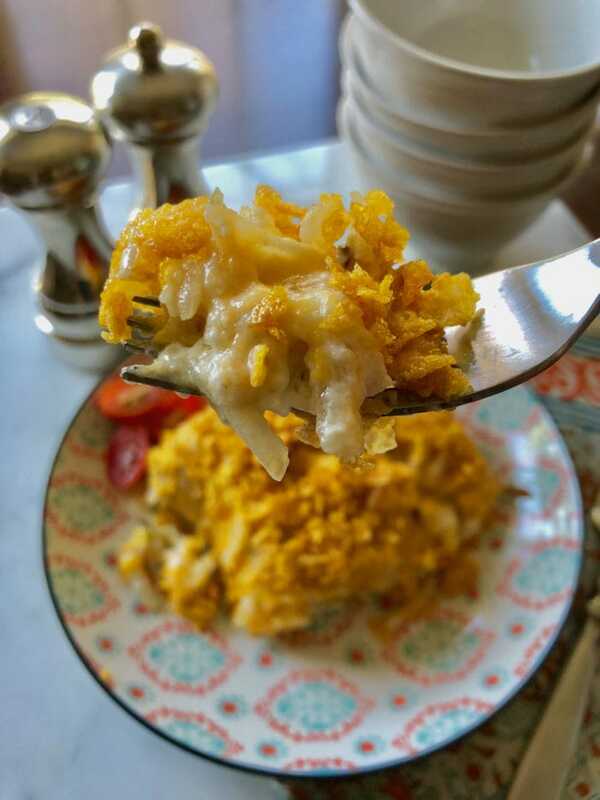 I love all these dishes..especially the creamy chicken and rice casserole without the soup! I will have to try that. I don’t measure too much, Will have to try them all. Always looking for something different. I save all of them! 2 cups of cooked rice cooked in chicken broth. Salt and pepper or any kind of seasoning, we use Tony’s Cachere’s. Season the chicken with salt and pepper. Brown chicken in pan slightly. Saute onions and peppers. Mix rice, remaining chicken broth and corn with onions and peppers. Pour rice and corn mixture into dish. Place chicken on top of the rice mixture, trying to cover all of it. Bake at 400 for 30-35 minutes (if boneless). Probably longer for boned.